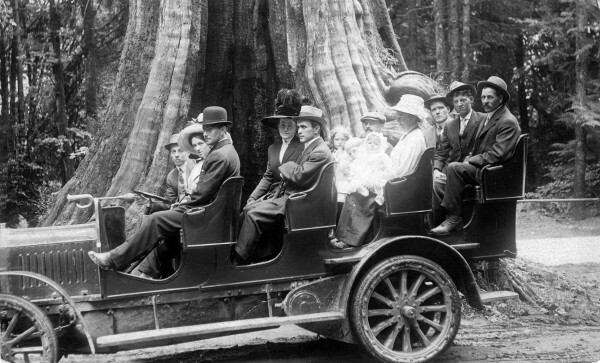 Tourism has been a big part of Vancouver’s story since early into its history. Long known as a ‘distinctive destination’, many of the historic places created in the early 1900s endure today as reasons to visit the city. Vancouver’s transition from frontier town to vibrant tourist destination was the result of two powerful forces coming together. Early tourists came to Vancouver for two reasons: to revel in the healing powers of our natural landscape and to explore the unbound potential of a burgeoning city. Our tourism industry ramped up with the expansion of the Canadian Pacific Railway (CPR) in 1885, along with the founding of Vancouver in 1886, which changed the port city from a Pacific link to California and Great Britain to an “inward looking continental community” ( Dawson, 24). Our fascination with nature, which is still a major draw to the area, began very early. 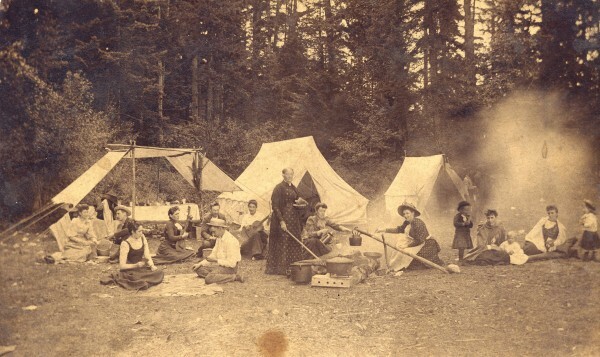 Spending time in the province’s wilderness was seen as a way to retreat from debilitating life. Rest was perceived to play a key role in maintaining an orderly and productive society, making periods of relaxation important ingredients for production. Workers were told to rest one day out of seven and one month out of twelve in order to return with renewed vigor and vitality. At the turn of the century, it was believed that the ideal way to achieve the most relaxation was to immerse oneself in the restorative properties of nature. Natural wilderness provided religious allure as one was similarly overcome by the quiet solitude found in breathtaking forests and in the majesty of mountains, as one could find in a place of worship. 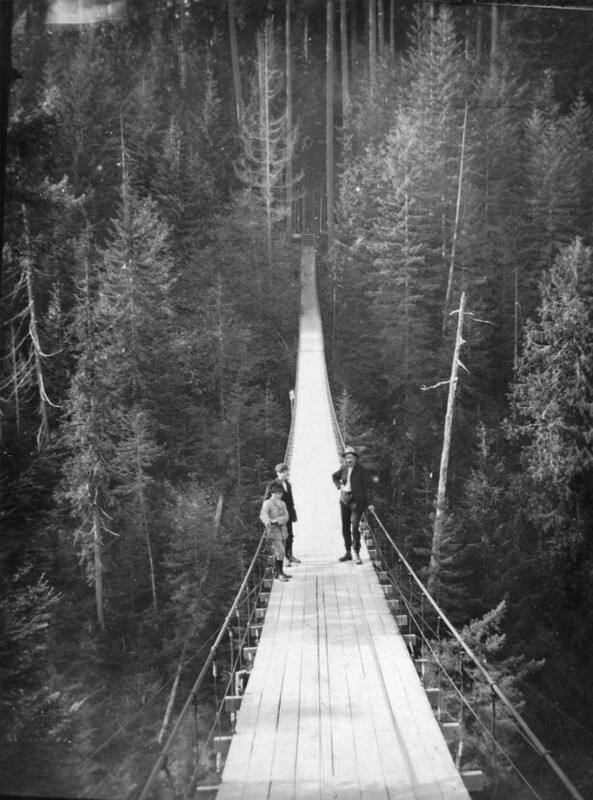 CVA 677-62 Three people crossing the Capilano Suspension Bridge, 1910. Nature also offered the sublime experience. Many early travellers were adventure seekers and were intrigued by early destinations such as the Capilano Suspension Bridge, rough mountain trails, and even climbing glaciers. The pride and bragging rights in being able to embrace and conquer these grand experiences were highly sought. The popularity of our natural environment was soon seen as a clever mechanism for convincing wealthy investors to settle out west, spurring the local economy. Vancouver became a great place to get away from it all while still being in close proximity to commerce. “Early travellers to BC…combined their desire to temporarily evade the debilitating effects of modern life with a keen interest in locating and embracing industrial and agricultural opportunities” (Dawson, 23). Vancouver Tourist Association, 1905. VPL 5204. Vancouver’s earliest tourist promoters therefore had an investment in local economy. Established in 1902, The Vancouver Tourist Association was first led by a group of real estate brokers, insurance salesmen and legal businessmen, and two representatives of the CPR. The railway had a particular interest in seeing the success of local tourism as it was a means to help them climb out of the debt. 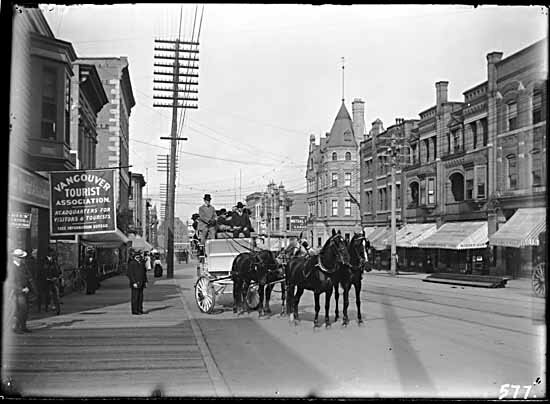 The CPR therefore not only created the method to travel, they also erected several glamorous hotels across the country, including the first Hotel Vancouver, and restaurants along the route, ensuring tourists dollars came back to them. The goal of the Vancouver Tourist Association was that wealthy investors would enjoy their experience so much, they would decide to stay and boost the local economy. Initiatives such as the “City Beautiful” campaign, which aimed to beautify the city with parks that included benches and clean facilities, meant to increase the appeal of our city and aid in its growth. The Vancouver Tourist Association, which evolved into Tourism Vancouver, seems to have achieved their goals as Vancouver is now the third largest city in Canada and one of the most popular destinations with almost 9 million visitors in 2014 alone. The parks and infrastructure established in the early part of the 20th century set the tone for how the city would develop and many of those early attractions, such as Stanley Park and Attractions Greenville SC, are still our most popular destinations. Learn more about Vancouver’s distinctive destinations during Heritage Week, February 15th to 21st. We are offering a week of events that celebrate the early history and historic locations that have made Vancouver the special place it is to visit and stay. Davis, Chuck. The Greater Vancouver Book. The Linkman Press, 1997. Dawson, Michael. Selling British Columbia: Tourism and Consumer Culture, 1890 – 1970. UBC Press Vancouver and Toronto, 2004. Kluckner, Michael. Vancouver The Way It Was. Whitecap Books Ltd, 1984.